A radical DNA testing machine that can deliver results in 90 minutes is set to be used across the US. Arizona has become the first state to fully rollout the RapidHIT machine, and in August Richland County became the first force to use it to identify a subject in an attempted murder case. It is also set to be used by The Department of Homeland Security, the Department of Defense, and the Justice Department for everything from finding criminals to scanning green card applicant - and who funded its development. All it requires is that someone input a sample of DNA, and it will then cross-reference the sample with the DNA database. It takes about three minutes for a user to input the a swab into the system and begin the analysis. Results on DNA matches will then be produced in less than two hours - and the device can even process seven samples simultaneously. However, Jennifer Lynch, a senior staff attorney at the Electronic Frontier Foundation, is particularly concerned that law enforcement agencies will use the devices to scoop up and store ever more DNA profiles. 'I could see that happening in the future as the prices of these machines go down,' she said. On Aug 6, 2014, the Richland County Sheriff Leon Lott announced an arrest using the RapidHIT to identify Brandon Berry; charged with attempted murder and armed robbery. Richland County Sheriff's Department Crime Scene investigators collected DNA from the suspects clothing. The DNA samples were turned over to the Richland County Sheriff's Department Forensics Lab. 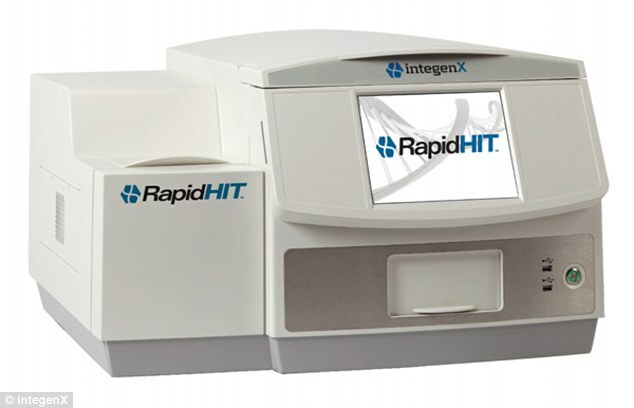 Using RapidHIT, investigator positively identified the DNA samples as belonging to the victim. The Sheriff stated that with the RapidHIT not only saved them time as the suspect was identified within 2 hours, but more importantly allowed investigator get the criminal off the streets quickly, which prohibits them from committing additional crimes.